I still remember the excitement I had when Yao Ming was drafted into the NBA almost a decade ago. As a Chinese American, there really weren’t many athletes to relate to culturally, and although I had never been to China nor did I even have relatives who lived there, I was still filled with anticipation. 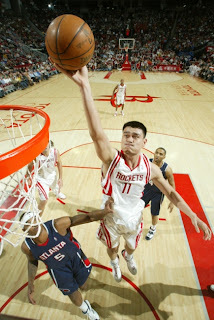 When the Houston Rockets took Yao first in the 2001 draft, all my past dislike towards the Rockets seemed to disappear. The nightmares created by the “Dream” when he blocked a possible championship-winning three by John Starks, vividly clear in my young mind, seemed to stop mattering. Or at least those Rockets were not Yao Ming’s Rockets. Yao was finally an Asian who would have impact in the NBA, not just some experiment or a guy that was 7 feet but shot more 3's than dunks and lay-ups. Being in middle school, I don’t think I had anticipated the start of a career like this ever before and maybe never will again. I remember watching his first few games where he looked out of place and overmatched by the speed of the NBA. Was this really the best player the entire continent of Asia had to offer? Then the most anticipated match-up in Yao's first year in the NBA happened vs. Shaq and the Lakers. Shaq turned the game into a joke, making some playful yet racist comments as he made up Chinese-sounding words and noises in a national interview. Yao didn’t say much. Instead, he let his play do the talking, scoring key baskets and eventually having a game-changing block against the Big Aristotle and defending champ Shaquille O’Neil. From then on, Yao Ming never really looked back, being voted into every All-Star game with the support of the largest nation in the world. China hit the internet in record numbers voting for Yao Ming every year as the starter of the Western Conference team. Yao Ming towered over players around the league but had a shooting touch of a guard and one of the smoothest turnaround jump shots on the block. Millions of children in China now dream of one day making the NBA. Yao’s career was far from perfect, as images of Nash crossing him over at the top of the key and players blocking him from behind cross my mind. His slower reactions are just as much a part of his legacy. But Yao was consistent and although his body suffered many injuries, he always gave his best for his NBA team and national team. I will never forget the tears he cried when there was a possibility he would not be able to represent China in the Beijing Olympics after he suffered yet another injuries. And I know Houston fans always think of what could have been if T-Mac and Yao were healthy at the same time since Houston’s only trip with Yao to the second round was without T-Mac and eventually without Yao who in 2009 was injured in that series against the Lakers. Yao meant way more to this game than his stats and wins. He gave Asians around the world something to cheer for. He did everything the right way. Yao Ming was always humble and never felt that he was entitled to anything, unlike the most recent product in Yi. It pains me to say that he seems more interested in his fame and success in the China media than his desire to make an impact on the NBA and world relations. For Yao, I went out of my way to watch him live, which even meant going to a Nets game in a Rockets jersey, and making a day trip from Austin to Houston to watch Game 2 against the Jazz in the 2007 playoffs. Thank you Yao for an amazing decade. I hope you continue to be a great ambassador of the game. Even more, I really hope your hard work has produced future Asian basketball players who one day can continue to try and fill the large shoes you have left behind.